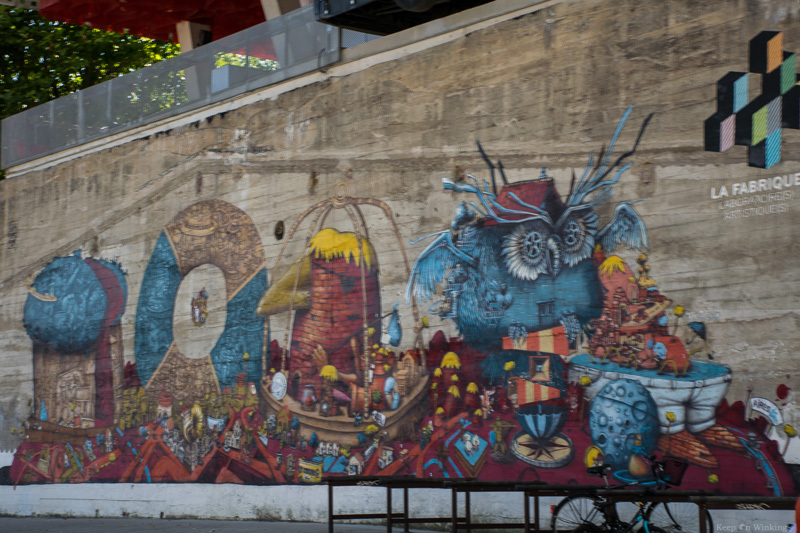 Throughout the city of Nantes you will experience playful art intermingled with everyday culture. 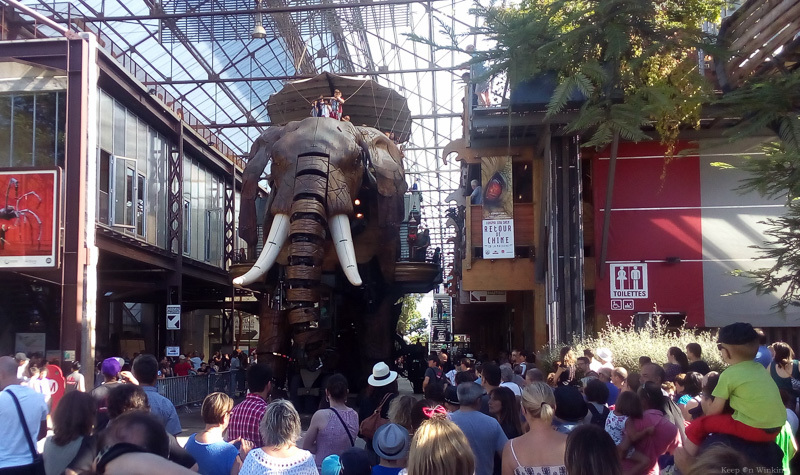 On the l’île de Nantes you will find that it goes a step further… it moves! Please avoid this place at any cost! 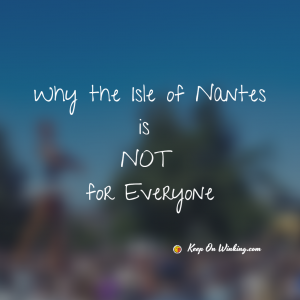 Luckily for everyone else the Isle of Nantes is perfectly suitable. The tourist booklet described this as the invention of Jules Verne’s and Leonardo de Vinci’s inventions brought to life. It sounds amazing because it is amazing! Off we went to see what we could find… What we discovered was a public space that turned an old shipping yard into a cultural and artist affair. In the Galerie des Machines is an exhibit that demonstrates the designs of the past, current, and planned creatures. From here you can wait in line to catch a ride on one of several delightful assortment of mechanical animals. Otherwise you can catch them in the act as they stroll around the shipping yard. One of our favorite creations to watch was an automaton that pushed a shopping basket. He would ask for charity and if someone came up to give him money, he would hold out his hand and take it! It was really neat to see what machines can do! The Carrousel des Mondes Marins is an assortment of sea creatures sculpted and then placed in the carousel at the “sea level” you would naturally find them in. Not only a work of art but it’s rideable aquarium! The times and dates vary by weather and season. My advice is to check their Practical Information page for days they plan to be open get there early. The sun can be brutal in the afternoon for the passing observer, but imagine the operators sitting in the metal contraptions? See the Heron on the left? It’s part of a new project to hit the scene in 2019! This is the long white building between the Galerie des Machines and the Carrousel des Mondes Marins. If you want to know more about the history of the shipbuilders or possibly the archaeological contributions then this is one you don’t want to miss! The island has undergone several stages of evolution. 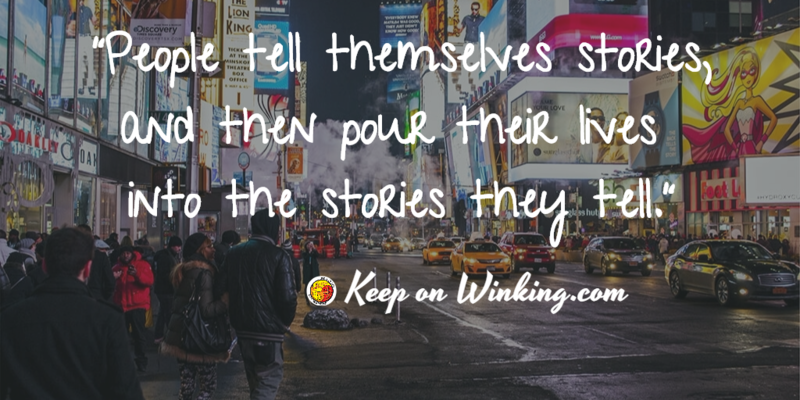 See what influenced them to make the changes they did and what they are planning for the future! Described as an artistic laboratory that features and hosts a creative assortment of amplified… music. It sounds fascinating enough to plan a second trip simply to experience their experimental art! There were very few place that I saw where you can plan a little picnic and a day’s excursion on the isle will at some point require refreshments! At the far end of Galerie des Machines hall are a few restaurants and in front a bar next to the gift shop. Or head to La Cantine du Voyage. The canteen offers an open space eating venue suitable for families and those wanting to relax with a great view of the river. The Arbre a Basket (The Basketball Tree) is a neat structure you will find being used as you cross over on to the island on your way to the Galerie des Machines. Over past the carousel is the On Va Marcher Sur la Lune where you can let your kids bounce around a lunar crater. See how this art was made! Pass the lunar playground you will find the iconic Lunar Tree and The Rings, near La Cantine du Voyage. Two pieces of art that challenges you to see the river with a new perspective. The Isle of the Machines is a siren call to many and it’s easy to lose a day here without realizing it! If it doesn’t speak to you consider a few other alternatives in Nantes.